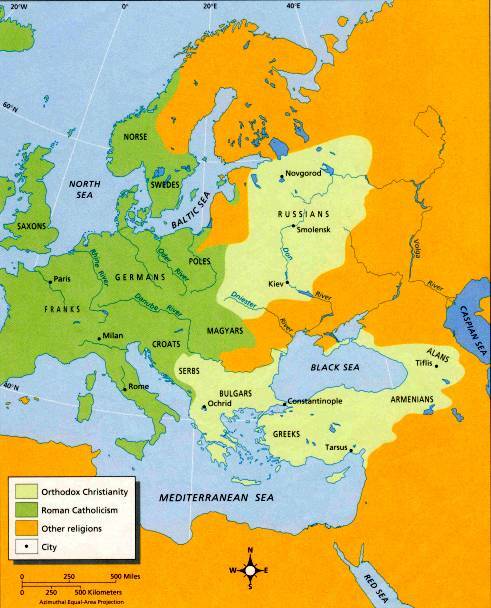 Sporadic schisms in the common unions took place under Pope Damasus I in the 4th and 5th centuries. [page needed] Disputes about theological and other questions led to schisms between the Churches in Rome and Constantinople for 37 years from 482 to 519 (the Acacian Schism). Most sources agree that the separation between East and West is clearly evident by the Photian schism for 4 years from 863–867. Roman dominate Emperor Theodosius I convened the second ecumenical council (Constantinople I) at the imperial capital city in 381. The council elevated the see of Constantinople, to a position ahead of the other chief metropolitan sees, except that of Rome thus raising it above the sees of Alexandria and Antioch. [b] This action has been described as sowing the seed for the ecclesiastical rivalry between Constantinople and Rome which was ultimately a factor leading to the schism between East and West. [c] It demarcated the territory within the praetorian prefecture of the East into five canonical territories corresponding to the five civil dioceses: Diocese of Egypt (metropolis in Alexandria), Diocese of the East (metropolis in Antioch), Diocese of Asia (Metropolis of Ephesus), Diocese of Pontus (metropolis in Caesarea Cappadociae), and Diocese of Thrace (metropolis in Heraclea, later under Constantinople);[self-published source] The council mentioned the churches in the civil dioceses of Asia, Pontus, and Thrace, it decreed that the synod of each province should manage the ecclesiastical affairs of that province alone, except for the privileges already recognized for sees of Alexandria and Antioch. In the course of the Fourth Crusade of 1202-1204 Latin crusaders and Venetian merchants sacked Constantinople itself (1204), looting the Church of Holy Wisdom and various other Orthodox holy sites, and converting them to Latin Catholic worship. The Norman Crusaders also destroyed the Imperial Library of Constantinople. Various holy artifacts from these Orthodox holy places were taken[by whom?] to the West. The crusaders also appointed a Latin Patriarch of Constantinople. The conquest of Constantinople and the final treaty established the Latin Empire of the East and the Latin Patriarch of Constantinople (with various other Crusader states). Later some religious artifacts were sold in Europe to finance or fund the Latin Empire in Byzantium - as when Emperor Baldwin II of Constantinople (r. 1228–1261) sold the relic of the Crown of Thorns while in France trying to raise new funds to maintain his hold on Byzantium. In 1261 the Byzantine Emperor Michael VIII Palaiologos brought the Latin Empire to an end. However, the Western attack on the heart of the Byzantine Empire is seen[by whom?] as a factor that led eventually to its conquest by Ottoman Muslims in the 15th century. 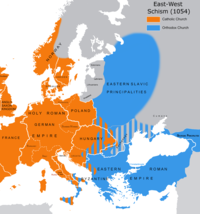 The ecclesiological dimension of the East–West schism revolves around the authority of bishops within their dioceses[not in citation given] and the lines of authority between bishops of different dioceses. It is common for Catholics to insist on the primacy of Roman and papal authority based on patristic writings and conciliar documents. The Eastern Orthodox Church holds that "there is a state beyond death where believers continue to be perfected and led to full divinization". Although some Orthodox[who?] have described this intermediate state as purgatory, others distinguish it from aspects associated with it in the West: at the Council of Ferrara–Florence, the Orthodox Bishop Mark of Ephesus argued that there are in it no purifying fires. Collier, Theodore F. (1911). "Constantinople, Councils of" . In Chisholm, Hugh (ed.). Encyclopædia Britannica. 7 (11th ed.). Cambridge University Press. Collier, Theodore Freylinghuysen (1911). "Chalcedon, Council of" . In Chisholm, Hugh (ed.). Encyclopædia Britannica. 5 (11th ed.). Cambridge University Press. p. 803. ^ The Ancestral Sin John S. Romanides George S. Gabriel, translator[page needed] Archived 12 July 2011 at the Wayback Machine. Store.holycrossbookstore.com. Retrieved 2 June 2012. Taft, Robert F (2010), Perceptions and Realities in Orthodox-Catholic Relations Today (PDF), Fordham [dead link].